There are plenty of great food websites to recommend restaurants around the world. Look for them by typing "Great Restaurants" plus your destination into Google. Also check your guide book for suggestions. Here are six examples of how I ate wonderfully and had a tasty adventure. It's a search for the Perfect Meal around the world. 1. A giant feast at the Hofbrau House in Munich, Germany. I have no idea how many times I have been here. Each visit is unique, and a whole lot of fun. I always meet exciting people from all over the world and eat great food. Graffiti on the table testifies to generations of revelers who came to have fun, drink great beer and enjoy heavy, but very tasty Bavarian cuisine. 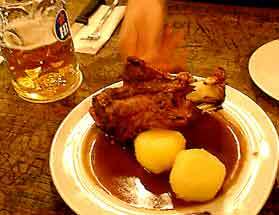 This is Haxe, roasted pork knuckle with potato dumpling, the perfect Teutonic meal to go with a liter of Hofbrau Oktoberfest beer! This meal might look normal sized, but it's not. That plate is 66 cm or 15" across. The Haxe itself is longer than the knife or fork. 2. A four Michelin star dinner masquerading as a three star in Chamonix, France. The Hotel King Albert the 1st has a three star restaurant (now four.) Two Canadian brothers (that I met on a Swiss train) and I decide to have a great meal there as well as stay for the night. We go to the restaurant three hours before it opened and go through the whole menu with maitre d'. He is wonderfully patient and helpful. His English and culinary insights are superb. Creative choices greet us from a beautifully hand written menu, art itself. It is both a fascinating journey and a ruthless obstacle course. We negotiate it all with intensity and as much calm deliberation as we could muster. In the end it is fantastic lesson in French culture, wisdom, and, of course, great food. My meal is perfect. The presentation and ambiance, outstanding. I can really see how people can fall in love with such great dinners. I have sautéed trout, creamed squash, fresh cheeses, a truffle salad, and dessert with figs prepared for royalty. Great food. The flavors crash yet melt together, swelling to a crescendo here, adding a sweet, soft note of savory there. Most of all, I want to try a truffle dish prepared by a master. I want to taste what all the fuss was about. The earthly smell and intoxicating fragrance carries me on a ride through cartoon countryside of elves and other magical creatures. I take another bite and then another. What glorious ecstasy. Great food. And then I'm suddenly finished. I'm angry at the loss. No more truffle salad. It really does tastes good as its price would indicate. 3. Fish soap in San Remo, Italy on the beaches of the Italian Riviera. I order the fish soup at a tiny beach restaurant. I didn't know that it came with the heads and tails. Soup is normally my trick for eating safe, (without those strange ingredients) in areas where the some of the great food groups are unknown or unrecognizable. After all, how can you make soup unappetizing or dangerous? The fish soup arrives and I stare at three sets of eyes. Big chunks of freshest fish heads, whole tender squid, and spicy eel all compete for my attention. Yet it smelled delicious. I take a deep breath and proceed to eat everything but the fish lips, which are too hard and sharp to be safely chewed. Much to my surprise it's all fabulously delicious, almost like a French Bouillabaisse only very Italian. A great testament to Italian cooking, and a lucky chance for me to taste a prized delicacy on the Italian Riviera. Discover your own fish soup creation. 4. 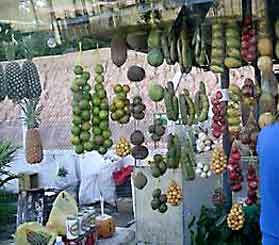 The biggest culinary surprise I found in Brazil was its roadside fruit stands. They have a multitude of jungle fruit juices (sucos in Brazilian Portuguese). Many of them have no equivalent names, tastes, or smells in the Western consciousness. They are off the map! Note the two types of pineapples on the left side of the picture. Acerola – cherry red fruit flavor; a great source of vitamin C.
Bacaba – Sweet whit fruit used in wines syrups. Biribá – Custard apple with a lemony flavor plain. Buriti – peach flavored palm-tree fruit. Cacau – creamy pulp from cocoa pod; tastes sweet. Great food textures. Cuja – pear like taste. Carambola – originally from Malaysia, shaped like a star; taste between lemon and lime. Fruto-do-conde – green apple with a sweet taste; served by itself. Genipapo – definitely an acquired taste; smells a little like a latrine; Used by warriors to temporally tattoo the body before going into battle. Murici – caramel sweet flavor, a little gritty texture. Sapoti – a little sweet with a touch of Worcestershire flavor. Tamarillo – Tangy with the taste of tomatoes and passion fruit. Great food flavor combination. And there's a lot more Brazilian Fruit to be discovered, just not here. The fruit that I had might be on this list. I don't have a clue. I didn't have the time to ask. I just eat and enjoy. The flavors and aftertastes have enough horsepower to provide color to the color blind and style to the clueless. It was like showing a Communist a grocery store produce section for the very first time. I crumpled in amazement. 5. Then there is that indescribable lunch waiting for me after my work assignment in Manus, Brazil, the capital of the Amazon. Let me try to describe this great food experience. I walk out into 90% humidity with my co-workers in order to reach the cafeteria. A sudden downpour brightens the day. We wash our hands in the outside sink under large overhangs. The cafeteria door opens. We pass through the 30's styled subway turnstiles and go over to pick up our trays and silverware. The Salad Station contains giant bowls of sliced green tomatoes, papaya, green peppers, cabbage and some kind of yellow fruit. I don't ask. There are four saucers with spoons in them. The saucers have vinegar, oil, pepper water, and what I call black water. I think it is soy sauce but it is a mixture of different fruit flavors, not at all unpleasant. The fruit juice section is magnificent. I choose Sapoti juice - a little sweet with a touch of Worcestershire. It has a strange flavor combination that my British co-workers confuse with a savory paste made in England called Marmite, that's spread on bread and biscuits. Some fruits must come from outer space. You eat the white seed pods inside. There's no real fruit tissue that I can find! This is pure travel, pure exploring like I want to teach you. It's not about what someone else's experienced and put in a guide book. It's taking one step after another as you discover the universe with all your senses. Next there's a hot table with giant trays of great food at the Main Entrée Station. The first tray holds white rice. Next, delicious black beans, then brown beans, vegetable soup and two choices of meat. The meat could be beef or something else caught and killed in the Amazon forest. I don't want to know. I take little of each and hoped for the best. I consider myself pretty brave. I sit down and begin to eat. I'm delighted with everything I chose. All this great food is delicious, mild in flavor and interesting in taste. I go back for more. It is very Mexican in more ways than one; the sauces, texture, taste and style. This is the best jungle food I've ever eaten. This is in large part due to a new condiment that I found - farofa. This manioc flour comes from the diets of local Amazon Indians. It's roasted and combined with other spices. It is light yellow in color and crunchy in texture. It reminds me of Shake and Bake mix without the grease and oil. It turns marginal mystery meats into tasty, trust-worthy entrée's that I wolf down. This is a very important discovery for me. No wonder farofa is a Brazilian staple. I'm looking for it when I get back to the United States. 6. Eating in China - a short introduction. 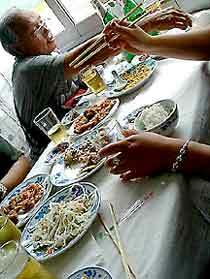 Meals are considered social events in China. They are geared to groups of diners sharing a variety of different dishes of great food with their companions. The principles of Chinese cooking are based on the desire for a healthy harmony between different ingredients. The Chinese wish to consider the yin and yang attributes of various dishes. For example, is it "wet" or "dry"? Is it "sweet" or "sour"? Texture and color are important as well in great food. Usually there is a round Lazy Susan located in the middle of the table… a circular surface that rotates when pushed right or left. This allows the diner to place the various dishes of great food within reach. Normally everyone eats with chopsticks, picking out food from the main serving dish, directly into their mouths. This always seems a little unsanitary to me, but the Chinese don't seem to mind. At Chinese restaurants, each diner receives a bowl of rice, an empty bowl, a small plate, a small teacup (with no handle) full of hot tea, a ceramic soupspoon and chopsticks. The meal begins by washing the bowl, spoon and chopsticks with the hot tea. This seems to be as much ceremony as sanitary necessity. Then the used tea is poured into a big bowl on the Lazy Susan and thrown away. Then plate after large plate with different types of great food are brought out. Some are really good, while some taste rather nasty. (Chinese hot pepper sauce is quite necessary here.) Some even contain broken bones. A few seem downright gross. Chicken-heads are included with the chickens. Fish-head soup is a delicacy that Chinese live for. Sometimes ten plates of great food come out for ten people. So this means each person gets almost half of kilogram (a pound) of food. Many dishes are never finished. It seems a big waste. (Perhaps the kitchen crew gets the doggie-bags). The meal ends with fresh fruit. Always welcome. During the meal, the teacup is constantly kept full. Waitresses are always coming around filling your teacup. It gives one a feeling of being cared for, except when one is trying to leave an empty plate and teacup. They always end up half full. I think the Chinese spirit lives for eating, partly to avoid possible starvation… so they eat almost anything. Besides, their reason to eat certain foods seems to include a little quackery… snakes for good eyesight, deer antlers for good sexual performance, etc. But the ingredients are always fresh. Many of the animals die in the kitchen or in the back room before being served in the front. 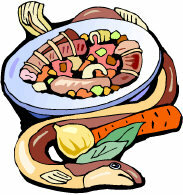 Snakes in certain restaurants are beheaded or skinned alive right in front of the customer, to prove they are fresh. Often blood is drained and the gall bladder removed and served directly to the customer. The rest is then chopped and thrown right into a hot wok! The reason many of the visitors to China don't get sick is because the Chinese have thoughtfully provided sanitizers for all eating utensils. Here is a sanitizer. 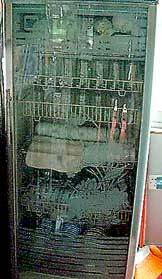 It looks very much like a refrigerator for dishes. Quite a startling sight until I figured it out. I don't know if they use heat or chemicals. My Restaurant Tips - Great Food include following the locals to their eateries and what to do when you get to there.